During the last two decades of the Wharf Revue, and in the shows at the Tilbury Hotel before that, Jonathan Biggins has created a gallery of unforgettable characters, from his wickedly funny impersonations of Tony Abbott, Peter Costello, Bob Brown, Gough Whitlam, Peter Dutton and Donald Trump to the (fictional) interpretive jazz-ballet dancer Jason Sponge, one of my own favourites from the Tilbury days. But the most popular crowd-pleaser of all has to be Paul Keating, who Biggins captures with uncanny accuracy. Bob Carr once said of Keating: “No political leader in Australia has been more entertaining.” The Bankstown boy who became the self-described Plácido Domingo of Australian politics certainly makes for a hugely entertaining onstage protagonist. Casey Bennetto’s Keating! The Musical, which began life in 2005, was a huge hit, touring for three years, winning awards and attracting sold-out, enthusiastic audiences, among them Keating himself who saw it several times. Now comes The Gospel According to Paul, a new show written and performed by Biggins who, in his theatre program note, dubs it “the first three-dimensional, unauthorised autobiography written by someone else”. 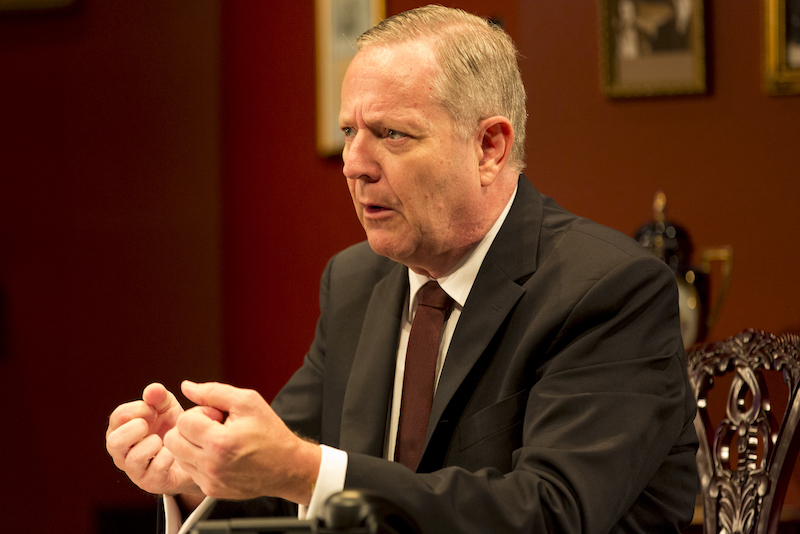 Running 90 minutes without interval, The Gospel According to Paul is hilariously funny, astute, insightful, and occasionally poignant as it follows the career of PJ Keating, who left school at 14 and rose to become the 24th Prime Minister of Australia. Biggins has successfully moved beyond the sketch-show format used in the satirical Wharf Revue and created a compelling comedy that certainly showcases Keating’s renowned wit, which he famously used to skewer his opponents, but a show that also examines the development and importance of his political career, while offering an insight into the kind of man he is. Designer Mark Thompson sets the piece in an old-fashioned room with a large wooden desk, an armchair, portraits on the walls, antique clocks, a record player with vinyl discs, and a slide projector to show photographs illustrating Keating’s life and career. In his program note, Biggins says that when Keating saw himself being portrayed in the Wharf Revue, his first comment was, “I’d have been wearing a better suit”. Biggins still can’t afford a Zegna but his voice, speech patterns, mannerisms and swagger are so utterly Keating-esque that you honestly forget you’re not watching Keating himself half the time. 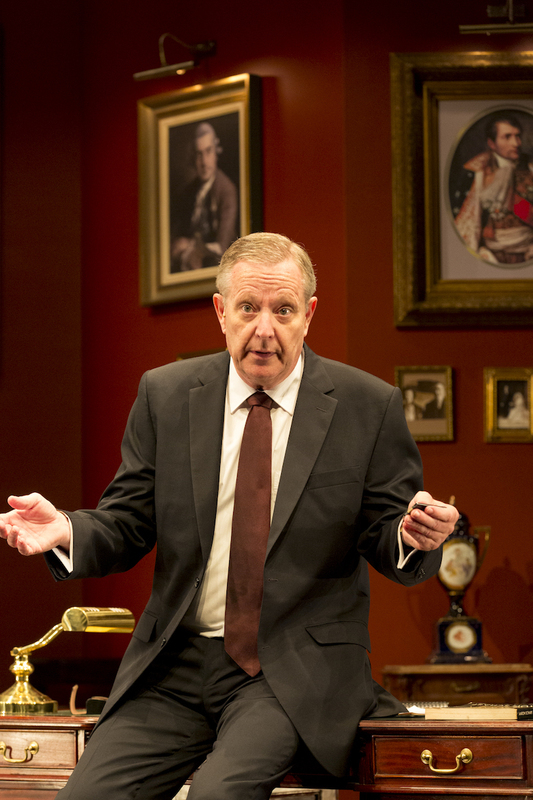 What’s more, Biggins is so in tune with Keating’s mindset, and so at one with his way of expressing himself, that it feels absolutely as if the cleverly written script is out of the mouth of Keating himself. The show does gently poke fun at Keating’s cocky self-regard, but mostly we’re there with the man, on his side, as we follow his career, which takes in working as a clerk for Sydney County Council where he learned all about electricity, managing rock band The Ramrods, joining the Labor party, learning at the feet of NSW Premier Jack Lang, driving his own bus when he was lobbying for the seat of Blaxland, working for Gough Whitlam, becoming Bob Hawke’s Treasurer, giving Australia “the recession we had to have”, then rising to Prime Minister himself. 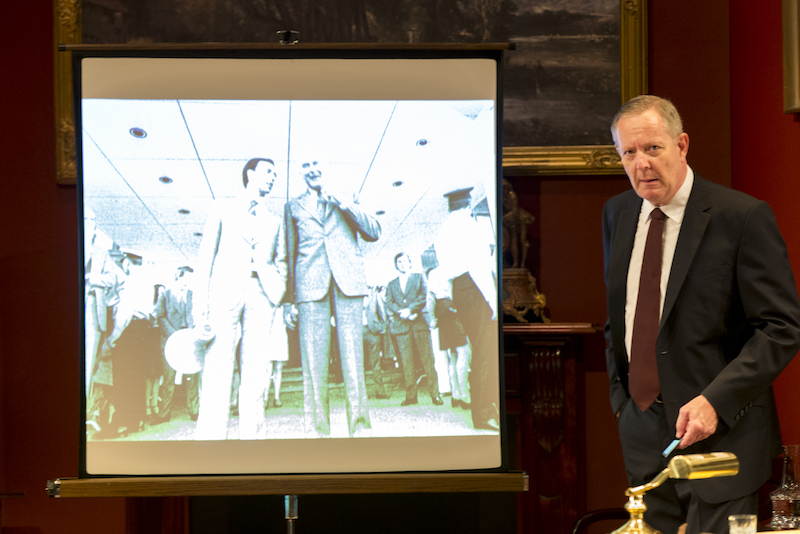 All the key political moments are there as well as Keating’s thoughts on what makes a true political leader, Australia’s relationship to Asia, and the importance of Indigenous affairs, which led to his Redfern speech and the Native Title Act. We also hear about his love of beautiful things like antique clocks and Swiss watches, and his passion for music – and not just classical music by the likes of Mahler and Chopin, but hits by Tom Jones too. There’s plenty of laugh-out-loud humour as he lacerates the likes of Scott Morrison, Andrew Peacock, John Howard, John Hewson and Alan Jones with astute, viciously funny comments. Along the way, Biggins also throws in three song and dance numbers, grooving along to Tom Jones’ Delilah, adding a vaudeville touch with a rewritten Puttin’ On the Ritz, and, ending the show with That’s Life. Biggins doesn’t delve into much personal material, though there are touching moments when he mentions the death of Keating’s father, and briefly references his former wife Annita and the challenge of maintaining a marriage and a political career in Canberra. Both moments pass quickly, but Biggins invests them with genuine emotion. Directed by Aarne Neeme, Biggins puts in a stellar performance. His comic timing is immaculate, and the balance between wit, dashing rhetoric, and serious commentary is finely judged. The show is probably one for the true believers, but with the date of the Federal election just announced, I left the theatre wishing there were more visionary, entertaining, charismatic, rabble-rousing politicians like Keating out there today. ★★★★☆ The Wharf Revue offers a welcome dose of political satire and budgie-smuggling hilarity. ★★★☆☆ Writing team impresses, but is a noir musical mystery the next big thing? He can play Richard Strauss on the trombone, but wishes he’d applied himself to more than retro-surf-bubblegum-pop. Jonathan Biggins and Phillip Scott’s irreverent update would surely have delighted Offenbach.